Beginning band is open to all 5th grade students who wish to participate in Band. They will learn to play traditional wind instruments or percussion instruments such as the flute, clarinet, trumpet, saxophone, drums and more. Students participating will have little or no experience playing an instrument. This group will be exposed to all introductory levels of band including the basics of music theory, tone production, and achieving a characteristic sound. The beginning band will perform a Spring concert during the first year. The Symphonic band is the top group of North Florida Christian School. The class is made up of all students with at least two (2) years playing experience. This group studies advanced band repertoire including jazz and focuses on the Theory, and History of music. They will perform at several concerts, FBA Competitions, FACCS Competitions as well as other performances that will be of educational value. The Concert Band is made up of students (winds and percussion) who wish to continue after beginning band. Usually, students have at least one (1) year playing experience, however this is not a requirement. This group will continue to focus on fundamentals of music, music theory, achieving a good characteristic sound and tone, and focus on music reading and performing band literature at the second year level. The Concert band will have an opportunity to participate in FBA Solo and Ensemble competitions, as well as FACCS competitions both district and state levels. The Marching Eagles combines Concert and Symphonic band to perform half time shows during football games. The band also performs at selected away games, pep rallies, parades, and the FBA Marching Band Festival. Included in the band is the Guard, which adds color to the field show using a variety of props such as flags, rifles, swords and other materials. Eagle Praise is the elementary competition choir that includes third through fifth grade students. Students audition to be a part of Eagle Praise and perform throughout the school year. Performances include Grandparents’ Days, Christmas Concert, NFCS Day, FACCS Regional Fine Arts Festival, Spring Concert and the FACCS State Fine Arts Competition in West Palm Beach. The group learns to sing in unison, two and three- part harmonies through various styles of music. The choral program allows the students to express themselves vocally using the techniques and training as they prepare for programs and competition. The Elementary and Middle School choral program participates in the Florida Association of Christian Colleges and Schools annual Fine Arts Festival. Local performances include concerts at the school for the community to usher in the Christmas season and their Spring Concert. The High School Ensemble gives those musicians the opportunity to continue their development as they join in the concert schedule and other performances. The choral program prepares students to perform using their talent and training, and it also provides an opportunity for broadening their perspectives on the influence of music by studying and performing sacred and secular literature from the Renaissance through the current century as well as music from other cultures. The Praise Team is an elective class made up of high school students who audition in the spring to be part of class the following year. This group consists of singers, band members, and a technical cast. The Praise Team can be heard regularly at Middle School and High School chapel programs as well as during Spiritual Emphasis Week and other school events. Their purpose is to lead our students in worship. The NFC Jr. Players is designed to introduce students in grades 3rd through 5th to the theater and help them exercise their imaginations. Students meet once a week and participate in different exercises to help them better understand acting and begin preparing for our production. Students learn the many aspects of putting a stage production together and have the opportunity to participate either on stage or behind the scenes in our spring production. 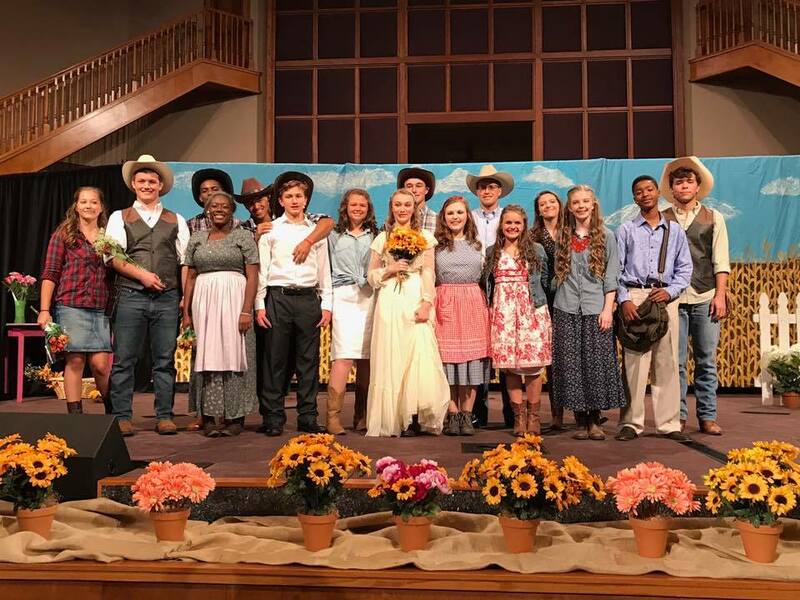 Jr. Players have performed many plays including The Emperor's New Clothes, Beauty and the Beast Jr., OZ, Annie Jr., The Sound of Music, and The Lion King Jr.. The NFC Jr. Players…bringing the stage to life! The middle school drama program, The Showstoppers, is open to 6th - 8th grade students. It builds upon the skills learned in the NFC Jr. Players. Students continue to develop their skills on the stage or behind the scenes depending on their interest. Each year the group presents a play to the students and families of NFC. They spend months rehearsing and preparing for their show and it is always a big hit. 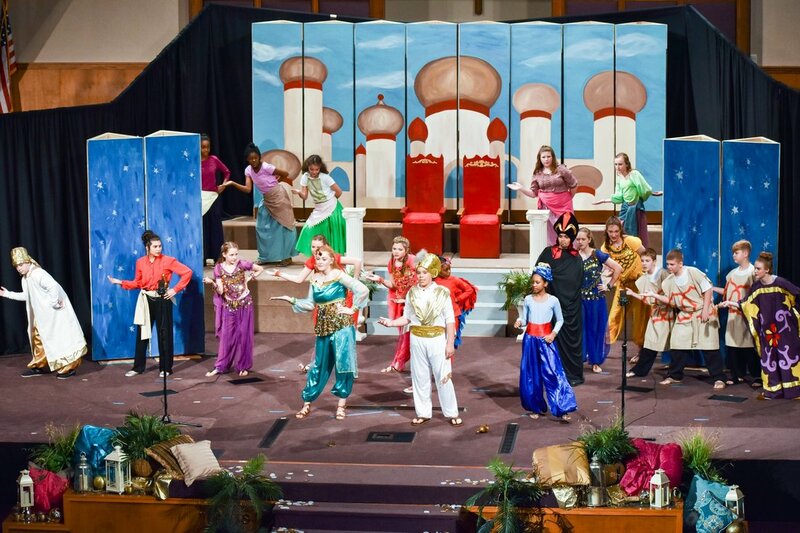 Among the shows the group has presented are Elf, Jr., High School Musical, Jr., and this year's hit Aladdin Jr.
9th -12th grade students who have a passion for performing. The spend countless hours working on learning scripts, creating backdrops, mastering dance moves and putting to good use the skills they learned in Jr. Players and The Showstoppers. This year the group will present High School Musical 2. Past plays have included Robin Hood, Ten Little Indians, Our Town, and Oklahoma.